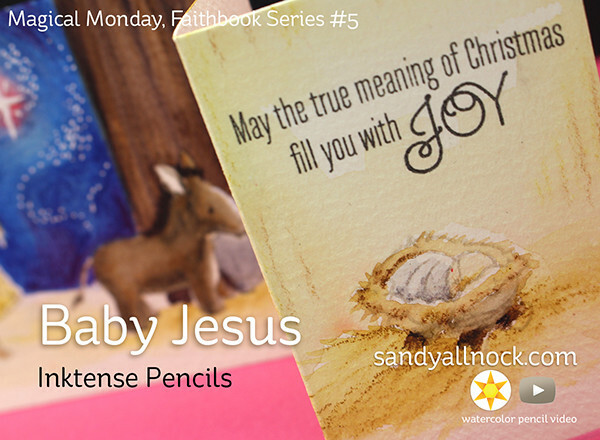 My Faithbook post for this month is also a Magical Monday card….just some lovely coloring and holiday music to get you into the true spirit of Christmas! 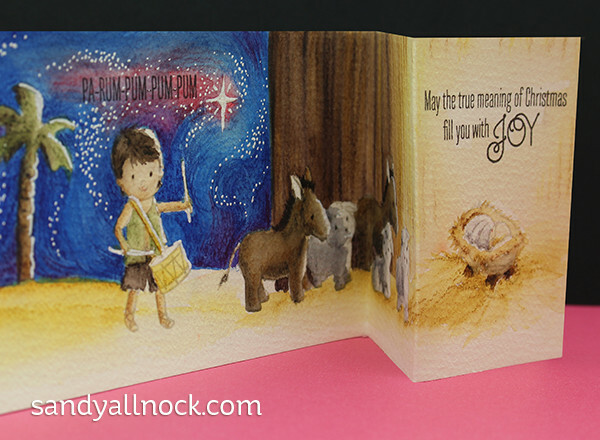 I had special long envelopes in my stash, and wanted to create a scene on a card custom-made for the envelopes with this Wplus9 Drummer Boy stamp set – they seemed to be a match made in heaven! I stamped all the images in hybrid ink, and started in with my Inktense pencils and a brush…one of the great things about Inktense is that it dries permanent – so as long as you strategically let areas dry while you paint others, you can keep the color bleeding to a minimum! Watch the video below or click HERE to watch in HD on YouTube! I’m not certain what I’d call this card fold; the paper is 3-1/4″ by 11″, and the folds are at 5 and 8 inches. You can adapt this to whatever your envelope size is; I wanted this to fit into a long thin envelope I had in my stash. The barn wall came out so well – with simple strokes of different colors! I started off with dark ones on the left, and gradually got lighter and thinner toward the light source – the King Himself! Below are links to the supplies I’ve used for today’s project; click on each picture or wording to go directly to the item. Affiliate links may used, which means if you make a purchase I receive a small commission at no extra cost to you. I truly appreciate your support toward the costs of running this blog! Read more. Sandy, this is so awesome………I have tears running down my cheeks. Thank you for your love………. Oh Sandy, this artwork is awesome, thank you for the most beautifull inspiration and the spirit of Christmas. Thank you for continuing to share your God-given talents with us and for this window of focusing on the real meaning of Christmas! God bless! Absolutely beautiful! And truly the real meaning of Christmas! Oh, I love this so much! First of all, watching you create and bring to life the images, along with the beautiful music was a lovely respite from the hustle-bustle that has already started. Secondly, there were so many little art lessons through the entire video. The night sky took my breath away — the swirling colors and use of the white gel pen — just magical! Thank you for always sharing your gifts so generously. I just love this card. I’d love to be the person getting it. I hope you’ll display it and let it pleasure others as it has me. Thanks. Beautiful VanGogh sky! Love your style and this card so much. Your talent reminds me of the story of another kind of talent in Matthew 25 beginning with verses 14. Thank you Sandy! I love watching you color – it just flows from your head to your hand without thinking what goes next – such a God-given talent, and thank you for sharing. Wow…. I am speechless… I sure wish I was the recipient of this fantastic card! Absolutely stunning Sandy. You have such a God given talent. I love watching you work!! Absolutely beautiful! Love the scene and your coloring never ceases to amaze me!!! Beautiful, Sandy, and I watched the video! Do you use Inktense pencils most of the time? I have a sort of “mishmash” variety and would like to know whether these are your “go to” pencils for watercoloring? Thanks! I’ll be doing a comparison soon, and am trying to figure out the ‘sweet spot’ for each brand. but i have more shopping to do first lol! Stunning. Fabulous layout and coloring. Wow wow wow, this is a magical work of art, fabulous work, Sandy! What a wonderful card that would be to receive. Absolutely amazing!! No words for this lovely card! you are fantastic!! Marvelous work Sandy! Nice to see such a unique stamp set too. I’d forgotten about W9… will have to go see what I’ve been missing. You are so incredibly talented. this is just beautiful. 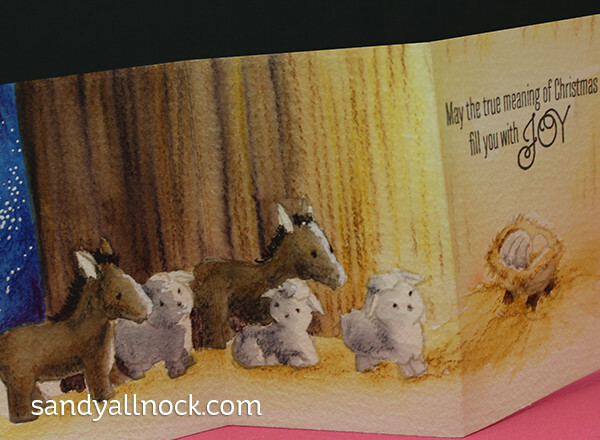 I’m swooning over this card–I love they way you show the “Light of the world”. Will you consider teaching a class in using Derwent Inktense pencils? Such beautiful artwork and the reason for the season. This is lovely. The contrast is wonderful and it helps to bring the scene to life. Thanks Sandy! Simply stunning. Love the sky and agree that the barn door, and how it’s lit, turned out really well. I think your recipient will love it!